Belton gave us our earlierst start for several years today with the lorry leaving the yard at 2am after we decided to do the trip in one day. Luckily it was worth it and the horses all went well. 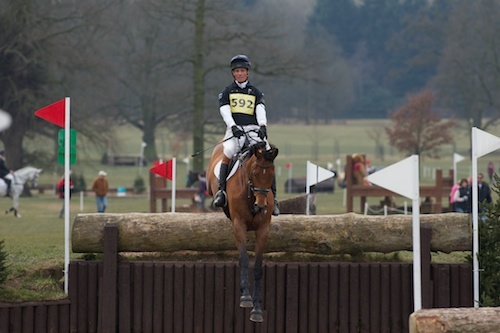 Neuf Des Coeurs gave me my first ever win at Belton leading his OI section from start to finsh. He did a very good test to score 28 in the dressage. He show jumped very carefully a lot more in control than last week and he gave me an excellent ride across country, apart from a suprise spook at the sunken road which gave me a bit of a shock. It is only his second run this year and he felt excellent. I am feeling it is a little bit of a shame that he isn't heading to America next week for Kentucky. Before Time felt very pleased to be out and was nice and relaxed all day. I was pleased with his dresssage of 32, his show jumping was excellent and he loved his cross country, only incurring a couple of time penalties to finish 4th in his section. Deli Star Hero was on the same mark as Before Time in the dressage, also putting in some good work. He unfortunately had a coupe of poles down show jumping, one of which I didn't even know he touched, but overall he jumped well and he gave me a very classy ride across country making the course feel easy. Mark Phillips' intermediate course was quite testing, asking plenty of questions and giving the advanced horses plenty to think about. Once again I cam away from walking the course thinking how pleased I was not to be riding any forst time Intermediates round! Despite the early start the times worked well, I had finished my last horse by 12.15pm so we will be back in Dorset by 6.30pm. I have a day off tomorrow as it's Chloe's christening and then next week we have to get the final preperations and packing underway ready for the horses to leave for Kentucky on Wednesday morning.